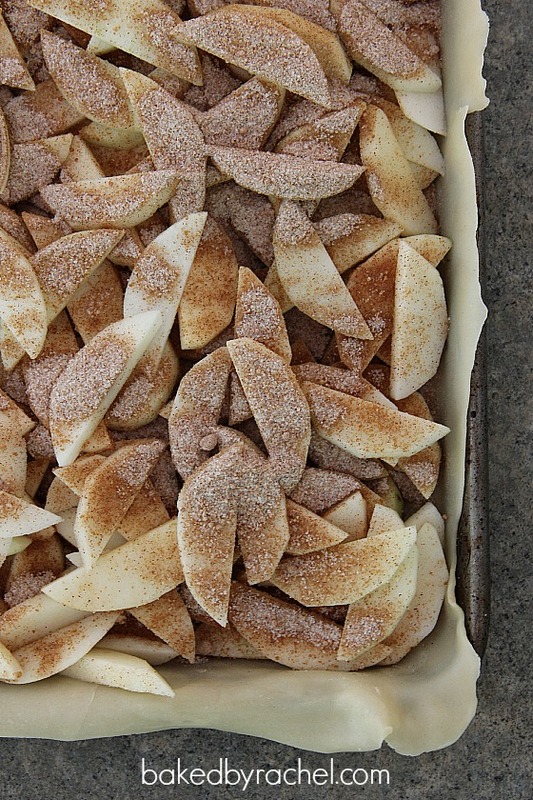 A double crust slab pie, filled with layers of cinnamon-sugar and thinly sliced apples. Perfect for a crowd. I have a serious obsession with apple pie. I got the raw end of the deal having a winter birthday. I don’t like the cold, outside of the fact that I can bundle up in warm clothes and drink hot chocolate and warm apple cider. I don’t want a birthday cake, I want pie. But not just any pie… apple pie. And I’d rather not a run of the mill frozen boxed variety either. This year, one way or another, I will have an apple pie for my birthday. But no candles and I definitely won’t be sharing it. Every year when September rolls around and my favorite apples become available, I pretty much go overboard hoarding them. I buy apples in bags that are big enough to stuff a child. Maybe a baby. A very large baby. Not that I’d use the bag for that purpose though. And then I run out of apples and need more. Because … I have this problem with making a dish that’s so insanely delicious I make it over and over and over again. Is there such a thing as pie eaters anonymous or apple hoarders anonymous? I should look into that. Last weekend we celebrated my two youngest sous chefs birthdays. Two days before the party… yes… total last minute girl here, I was out of eggs. So a layered cake was out. I ended up churning out an easy cake and this incredibly delicious (and also very easy) slab pie. The pie was a must in my book. 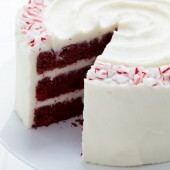 I was *this* close to not making a cake but that just didn’t feel right, especially since I needed cake for smash pics. Totally unacceptable to skip that. This might be my new favorite way to make pie. It’s ridiculously easy and serves a crowd! 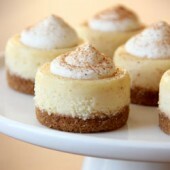 You can slice pieces as small as necessary to serve up however many guests you have. This double crust slap pie is filled with thinly sliced apples and a perfect cinnamon-sugar mixture. You might even want to make two, it’ll disappear so fast! *Note: I used Paula Red apples but feel free to use whatever apple variety you like best. These hold their flavor but their shape doesn’t stand up during the baking process well. Also, I used store bought dough for a quick fix but homemade dough may be used as well. Preheat oven to 350 degrees. Lightly grease a 12x17" jelly roll pan. On a silicone counter mat, roll out half of your dough (or 2 premade rounds) large enough to hang over the pan slightly, roughly 15x20. If some areas are smaller, don't worry. It can be patched with extra dough later. Flipping the counter mat upside down, carefully transfer dough to prepared pan. Gently press dough to fit bottom and sides of pan. In a medium bowl, combine flour, both sugars and cinnamon. Dust the dough with sugar mixer. Peel, core and slice 4 apples thinly. Scatter around the pan. Cover with 1/3 cup sugar mixture. Repeat two more times. Be sure to push apples into the corners. Drizzle 1 cup of heavy cream throughout the apples. Roll out second half of dough using the previous method. Carefully transfer to pan. Roll or crimp dough edges together to seal. Brush with 2 tablespoons of heavy cream. Generously sprinkle with sugar. Using a sharp knife, cut 2 inch holes into the dough to allow steam to escape. Bake for 50-60 minutes or until bubbly and golden brown. Allow pie to cool prior to slicing. Two winners will each receive one (1) Le Creuset Baker’s Set in red. 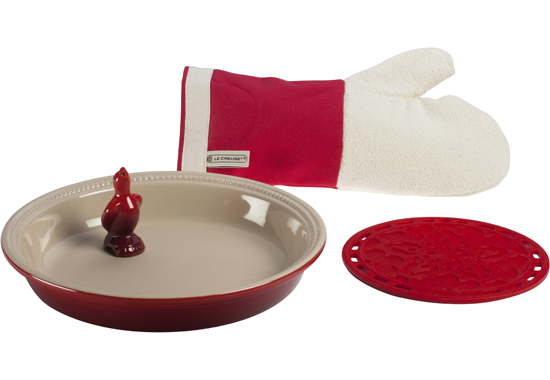 Set includes: pie dish, pie bird, French trivet and oven mitt. Giveaway will run from September 15, 2012 – September 18, 2012. Winner must be at least 18 years old and a US resident. Winner will be randomly selected and emailed. Winner has 48 hours to respond or another winner will be chosen. Main entry must be completed or extra entries will not count. Disclaimer: I asked Le Creuset to be a sponsor of An Apple A Day. I was not compensated for this post or giveaway. All opinions are my own. So want the Heritage 2 1/2 qt. 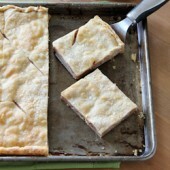 Square Casserole! I love the French Ovens in any color. Could you share where you purchased the purple tray? I was served something at a restaurant on the same dish, and I love it. Thank you! Can you tell me what type of apples would be best for this? I love using Cortland apples for most baking. But, I always recommend using whichever you personally prefer the flavor of. I just put this pie in the oven. I am super excited about this! I’ve been craving pie for days now. And my husband doesn’t like cooked apples, so that means I get the WHOLE thing to myself. That might be a bad thing, but I’m excited about it none the less. This is the cutest, easy to navigate, informational blog! I just love it. 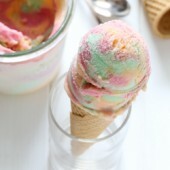 I am totally going to try this recipe! My son can not have dairy, can I substitute anything for the cream? Best bet would be to just skip that. It shouldn’t have a huge impact on the recipe itself beyond specific flavor and texture. 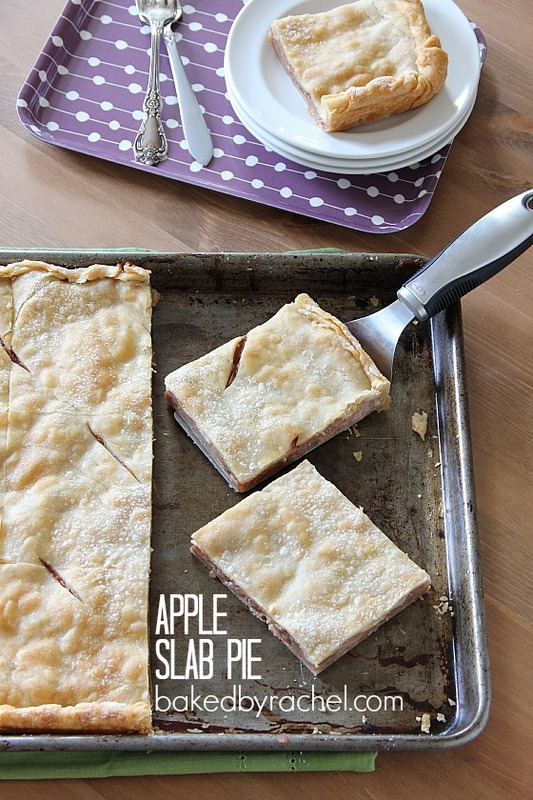 However, I have another recipe that may be better suited for you: apple crumb slab pie. It does not contain any dairy in the ingredients. 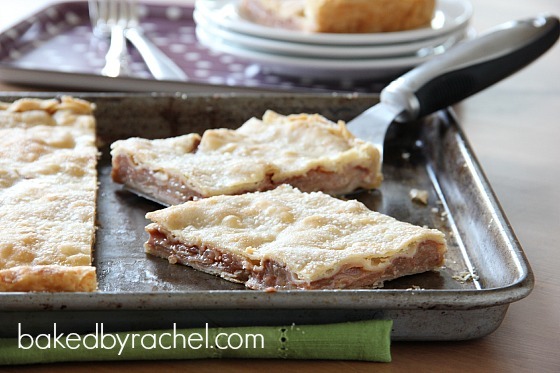 I have a single crust slab pie that you may want to check out: apple crumb slab pie. If you’re looking to use homemade for this, follow the directions from the link I supplied and increase the crust ingredients to account for the possibility of a second crust. Tried this today and it is absolutely delicious. I paired it with my MIL’s no fail pie crust recipe and I just couldn’t get enough. Thanks for sharing the recipe! I just had to comment to tell you about the reaction to this recipe I received. For my parents’ 50th anniversary, my mom decided on bars instead of cake. We had 12 different types of bars and the Apple Slab Pie was the only one that was completely devoured by guests. It was gone within 20 minutes of dessert and I was told over & over how great the flavor was. I attributed it to the way you layered the apples and sugar mixture. Thank you for such a great recipe.